Oh sweet mercy...what a week! Monday night I met up with my friend Louise to visit. Tuesday was a meeting at the church. Wednesday was my course. I've been staying late at the office each night trying to get ahead. Crazy. I was thankful for a quiet evening at home with my family last night. I just got some GREAT news last night. I woman I worked with when I was pregnant with Matthew has bought a house about 5 minutes from mine so we'll get to actually see each other for coffee and playdates. She has a daughter close to Jordan's age and a baby. So excited. I'm hoping to visit with my mama tomorrow and then go out on a dinner date with my Ian in the evening. Sunday is Palm Sunday and then next week... whoa! My girls' birthdays! Julie turns 12 on Wednesday and Jordan turns 5 on Friday. Life is full these days, that''s for sure. 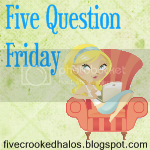 It's time for Mama M's Five Question Friday blog meme! Enjoy being just the two of you before adding to your family. Do things, go places, learn. Learn to be forgiving with one another. You will have many, many, opportunities to practice. Never speak poorly about your spouse to anyone. Ever. Once you do, you've opened the door for others to do it as well. Be their biggest cheerleader and their safe place. Start and finish every day with I love you. Ian does. But I do my own. I never buy organic anything. Ever. Fifty Shades of Grey. HA. Or watch Lost from beginning to end, or Flashpoint. We had a blizzard today. I seriously want to punch Mother Nature in the face. Ok! I'm off! Have a super day and a super weekend! How about this...you hold Mother Nature down and I'll punch her, then we can reverse roles? I love you, friend! Love your advice to newlyweds, it's spot on! Glad to hear you have a friend moving so close with kids the age of the littles. That's gonna be awesome. See told ya God knows what He is doing. It seems like you are really more happy now than... well, since I don't know you in real life I can't really compare it to another time. BUT you seem a lot happier. Yay!